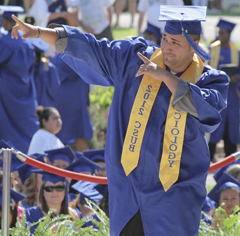 Each prospective CSUB graduate must file an application for graduation two semesters before his/her expected date of graduation. Filing the application for graduation on time allows us to evaluate your progress toward completing your degree requirements and awarding you the degree. Students who anticipate graduation should read the instructions on the following links carefully. Be sure to follow all the recommended steps before submitting your application for graduation. After initiating a “grad check” process, you may have additional questions about your progress toward completing your degree requirements. Please feel free to contact your academic advisor within the appropriate department or email one of the Evaluators in the Office of Admissions and Records. Click on Commencement Information to find out more information about commencement ceremonies at CSU Bakersfield.